Frank Sampson is considered an institution among Colorado artists, having taught at the University of Colorado in Boulder for 30 years in addition to steadily producing his art over that time. Now entering his nonagenarian years, he ranks as a master of allegorical paintings, as the 14 new works in this solo show attest. Borrowing from the style of Flemish Renaissance painters, Sampson portrays everyday people and pastoral settings in emotionally complex scenes. Animals play a dominant role, appearing together in unexpected combinations and subverting the characteristics we usually ascribe to them. Indeed, animals take on allegorical possibilities, as when a lion appears trapped behind a half-open window (“Lion in Venice”) or when a bear in the foreground plaintively looks toward two other bears roaming in a forest (“Inside-Outside”). One of the larger works, “The Verandah” suggests that animals and humans are on equal footing, with its expansive hillside scene showing a roving giraffe, elephant, tiger, camel and goat in coexistence, while lower in the painting a mix of individuals view the animals from the verandah of the title. The potential for harmonious relationships is even more apparent in “Waiting for the Train.” A clown dressed in white — perhaps a circus clown — sits with his shoulders drooped, his back to a table around which jungle and forest animals are nonchalantly waiting. Under the table, an alligator teases a lion. In the background, a woman in blue reaches for a stork. Despite the puzzling arrangement of people and animals, the scene connotes peaceful interaction. Sampson also gives a nod to mythology in “Daphne,” based on the story of Apollo’s amorous pursuit of a woman who is transformed into a tree just as the god approaches her. Childhood stories come to mind in “Hiding from the Bogey Man,” with its dark tones of red, orange and brown as it depicts a cowering girl. 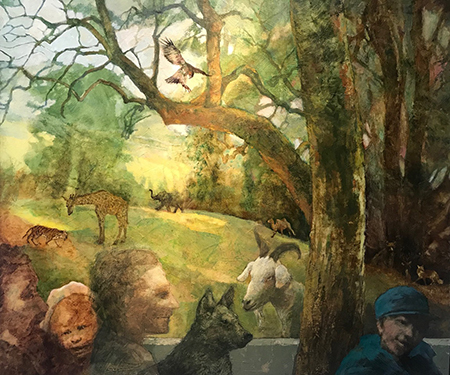 Sampson’s longtime observations of the human and animal world are fruitfully reflected in his enigmatic works. Yet the paintings remain invitingly colorful and eerily familiar, even when they deal with the tangle of our everyday behaviors, reactions and anxieties.